Access to your family doctor is one of the pillars of high quality care, and that is why I have always been conscious of my patients’ waiting times. “We can fit you in today or tomorrow,” is the usual response, but trying to maintain this standard will be challenging over the next month. I have had to slash the number of available appointments in half in order to work for the health region on a quality improvement project that aims to upgrade the efficiency and quality of service at the Lloydminster hospital. As mentioned in a previous post, I will be away from the 3rd of May to the 13th. I do not, however, foresee any interruption in the availability of urgent care. The Border City Clinic’s extended hours for advanced access started last week and is working well. There should be no reason for any of my patients to experience an interruption of ‘unplanned’ care. From the 14th of May onward, all services will resume as usual. Unfortunately, unplanned care has the potential to generate more telephone traffic. One of my pet peeves is trying to phone the clinic. The phone lines are notoriously busy and I often have to hold the line for several minutes. 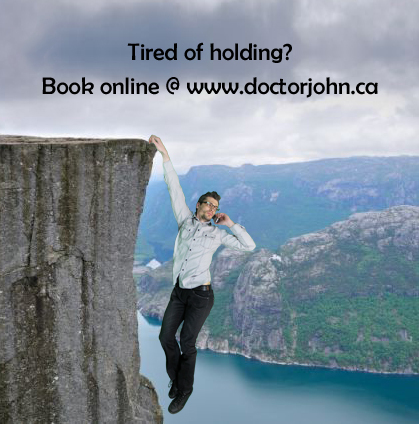 In order to save patients the same frustration, I have developed an online booking system. This experiment will be phased in over the next month and operate supplementary to orthodox bookings. While the overwhelming majority of patients will book appointments by phone, an online option may be preferable for some.